When Dixon first saw Arizona, he said "he had found his country." Dixon lived by, "If doubtful of your work, return to nature and renew your vision." Maynard Dixon was an important illustrator, mural and landscape painter. Parsons does not offer Maynard Dixon prints, because no print can compare to the real paintings. 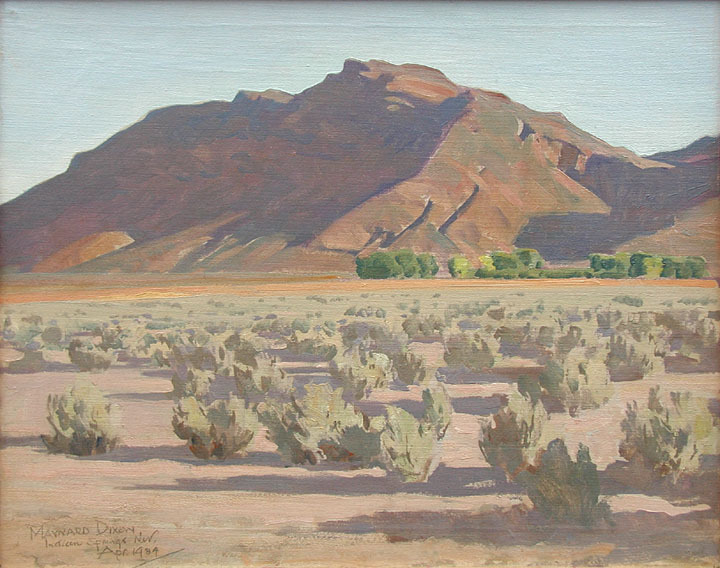 Lafayette Maynard Dixon was born Jan. 24, 1875, in Fresno, California, part of the San Joaquin Valley. He was first named Henry St. John Dixon, in honor of his fathers' great grandfather. When he was christened on September 8, his name was changed to honor his maternal grandfather. He was a renown master painter, illustrator and landscape and mural painter. He was a modernist, post impressionist and cubist realist. often using an Indian Thunderbird as a signature or logo for his work. He spent as large part of his life in the California desert around Indio and Mecca. A great number of his paintings were created in his home area of the San Joaquin Valley. Xavier Martinez, Edward Borein and Jimmy Swinnerton. He studied under Arthur Mathews (California School of Design in San Francisco). Charles Lummis was his mentor and sponsor. Dixon was honored by membership in the Salmagundi Club and National Academy of Design. He started drawing Western life when he was seven years old. Dixon was a sickly asthmatic child and found relief in sketching, which he began at age 10. At age 16 (1891), he was encouraged by Frederic Remington, who gave his work a positive review. Remington said his progress as an artist would be determined by how "time and your character will develop". In 1893 Dixon and his family resettled in Alameda, California. Dixon, encouraged by his mother, began to study at the California School of Design in San Francisco. He found the school restrictive, leaving after three months. Dixon wanted to learn from nature and practice in plein-air. In 1893 his art work was first published in the "Overland Monthly". In 1895 Dixon found full time employment with San Francisco Morning Call. in 1898 his drawings were published in the Los Angeles magazine "Land of Sunshine". In 1899 Dixon worked for the the San Francisco Examiner. and receiving regular exhibitions at the San Francisco Art Association. But he learned he needed to "go East to see the West." In 1900 he took his first journeys to Arizona and New Mexico, as recommended by his mentor, Charles Lummis. When he saw Arizona Dixon said he had "he had found his country." He visited and created art in Fort Mohave, Prescott, Tempe, Isleta Pueblo, and Santa Fe. After 6 moths, he returned to his native San Francisco. In 1901 he traveled with fellow artist Edward Borein by horseback to Nevada, northeastern California, Oregon, and Idaho. In 1902 he visited the famous trading post of Lorenzo Hubbell in Ganado, Arizona. He stayed there for two months, beginning a long term friendship with Hubbell. In 1905 he traveled with his friend Xavier Martinez to Guadalajara, Mexico. In 1905 Dixon was married to fellow artist Lillian West Tobey. She remained behind while he went on to draw minning settlements for Cosmopolitan magazine. In 1906 he lost most of his art work to the San Francisco fire. After the fire he crated special artwork for Sunset magazine called "The Spirit of the City" in hope of rebirth. Then he and Lillian moved to Sausalito, in Marin County, across the bay from San Francisco. for the Southern Pacific Railroad Depot in Tucson, Arizona. From 1908 to 1912, Dixon worked for Century, Scribner's, and Mc Clure's magazines in New York City. In 1909 and again in 1917 he traveled to Montana. In October of 1910 his daughter Constance Dixon was born. Dixon visited Coeur D'Alene, Idaho, and Cutbank, Montana. In 1909, traveling under the encouragement of Charles Moody, he drew the Native American Indians of Idaho and Nevada. Dixon labored as a cowboy for the C Cattle Company. In 1911 Dixon was honored by his election to Dixon Elected to the New York Society of Illustrators. He made the friendship of Robert Henri, and began a relationship with Sophie Treadwell, the playwright. In 1912 he declined Blumenscheins' invitation to the Taos Society of Artists. In 1912 he moved back to California, giving up his commercial work for murals and easel paintings. He was commissioned for murals by Anita Baldwin McClaughry. In 195 he was honored with the Bronze Medal at the Pan Pacific International Exhibition. However, he experienced a nervous breakdown during the Exhibition. His art works were shown in the Exhibitions Palace of Fine Arts. In 1917 he became divorced, because of his wife's alcoholism. He sought solace in Montana. Dixon became married to Dorothea Lange, a photographer. They were soon wed on May 21st. In 1922, the couple stayed at the Navajo reservation in Arizona. In 1923, Dixon was honored by an exhibition at the National Academy of Design in New York. There he showed his "Desert Shepherdess" and "The Ancients". In 1923 he stayed at the Hopi reservation at Walpi, Arizona. In 1925 his son Daniel Rhodes Dixon was born. In 1928 his second son John Eaglefeather Dixon was born. In 1929, in Phoenix, he painted murals for the Arizona Biltmore Hotel. From September 1931 to January 1932 he lived in New Mexico, Taos and Ranchos de Taos. He was invited to join the Taos Society of Artists, but declined. In 1932, needing money, he returned to California. In 1933 he traveled with his family to Zion National Park and Mt. Carmel, Utah for the summer. In 1934 he painted his "Forgotten Man" Series, show the suffering of peoples. During the 1930s Dixon created murals and paintings for the WPA. In October 1935 he and his wife divorced. In 1937 he sold Brigham Young University 85 paintings, sketches and drawings. In 1937 Dixon became married to artist Edith Hamilton. In 1937, his health forced Dixon to move to Tucson, Arizona, for the drier climate. In 1938 he created two murals for the Bureau of Indian Affairs. In 1939 he went to Tucson, Arizona. In 1940 he and his wife Hamilton moved to Mt. Carmel. In 1941, he built a house at Tucson. In 1942, he and his wife visited and traveled in Arizona and Utah. In 11943 he created illustrations for the book "Oregon Trail". In 1945 he was honored with a major exhibition at Scripps College's Florence Rand Lang Galleries. he created his last mural for the Los Angeles ticket office of the Santa Fe Railroad. He passed away at Tucson, Arizona in November of 1946. His ashes are buried in a Hopi bowl at Mt. Carmel. The land is now on the National Register of Historic Places. "Cartoon drawing of Arnold Genthe photographing a young woman"